Ten members of the Electoral College have called for a briefing before they officially vote in the next US President. 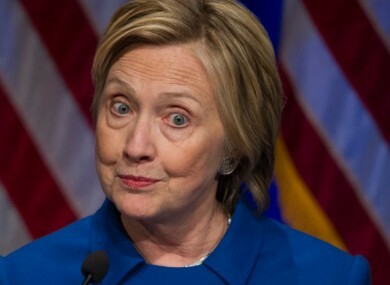 HILLARY CLINTON’S CAMPAIGN has said the Obama administration “owes it to the American people” to tell what it knows about Russian hacking of Clinton campaign emails and those of the Democratic National Committee ahead of last month’s US presidential election. Clinton campaign chairman John Podesta, whose emails were hacked and posted online, said “never before in the history of our Republic have we seen such an effort to undermine the bedrock of our democracy”. Podesta said the campaign supports an effort by a handful of members of the Electoral College, including a Republican who says he won’t vote for President-elect Donald Trump, to be briefed on US intelligence on potential links between Trump’s campaign and Russia. Today 10 electors released an “open letter” to the Director of National Intelligence James Clapper requesting information about ongoing investigations into ties between Trump and “Russian government interference in the election”. Podesta agrees with Senate Intelligence Democrats who last week called for President Barack Obama to declassify and make public intelligence information on Russia’s attempts to interfere in the election. “The administration owes it to the American people to explain what it knows regarding the extent and manner of Russia’s interference and this be done as soon as possible,” Podesta said in a statement. Trump previously told Fox News he rejected the CIA’s conclusion that Russia intervened in the election, saying it was “ridiculous”. The letter from the electors, released on the social media site Medium, was written by Christine Pelosi, the daughter of top House Democrat Nancy Pelosi of California. Minority Leader Pelosi, who receives super-secret intelligence as one of the top leaders of Congress, followed hours later with a call for an investigation by an independent commission. The 538 members of the Electoral College are due to meet in their state capitals on 19 December 19 to official vote in the next president. None of the electors who wrote the letter are likely to vote for Trump anyway. Nine are Democrats and the sole Republican to sign the letter is Chris Suprun, a Texas paramedic who says he won’t vote for Trump, citing a Federalist paper by Alexander Hamilton that says electors must determine that the president is qualified and independent from foreign influence. Suprun attracted national attention with a New York Times column last week in which he said Trump is “someone who shows daily he is not qualified for the office”. The letter says the Founding Fathers envisioned the Electoral College as a deliberative body and not simply a rubber stamp to ratify the results. “The Constitution envisions the Electoral College as a deliberative body that plays a critical role in our system of government — ensuring that the American people elect a president who is constitutionally qualified and fit to serve,” the electors wrote. Twenty nine states and the District of Columbia have passed laws designed to bind members of the Electoral College so that they are not “faithless electors” – voting against who won the popular vote in their state. Email “Clinton campaign presses for intelligence briefing on Russian hacking”. Feedback on “Clinton campaign presses for intelligence briefing on Russian hacking”.